Since this announcement has been published a few days before #VMworld and will affect most of the VMware Users / Administrators, I am informing you about the fact that the vCenter for Windows and the flash based Web Client are deprecated and will have their last appearance with the next feature-release of vSphere. It has been about time that we get rid of the flash based web client. A vendor’s design decision for flash has been one of the most painful thing over the years: vCloud Director, Horizon View, vSphere, vRealize Operations…. Great to see slowly that VMware moves to a slick HTML5 User Interface. For the HTML5 based vSphere client it took a while, but since the fling has been released it seems that the right people have gotten the resources to develop it further. Rapid release cycles and openess for feedback via twitter…. This is how it should be done… One minor critics by myself… It would have been good to be able to update the productive html5 based vSphere client in the same granular level as it is possible with the fling . 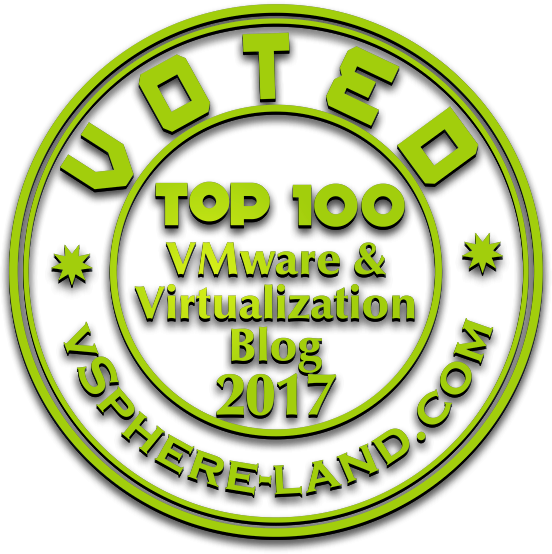 At the same time most of us can agree on that the vCenter Server Appliance and the corresponding migration tool does a great job. No struggling around anymore with database admins or database availability / odbc versions,etc. If multi-nic support gets into the vCenter Server Appliance I don’t have any use-case left where a Windows vCenter Server would be required. It is nice to see vCloud Director is still making progress. It is a valuable solution to offer cloud services in form of catalogs to the customer. I was hoping that we get totally rid of the flash bashed user interface. Weeknesses regarding their NSX integration must be further analyzed by myself (follow-up post coming as soon as I have the details). vRealize Network Insight (vRNI) is a product created out of the acquisition of Arkin. vRNI helps to gain visibility into our (NSX-based) virtual and physical, cloud and on-premises network in an intuitive way. vRNI is an awesome piece of software giving you insides into your network you have never had before. Regarding the SaaS solution I am not 100% sure how people will like to send all kind of sensitive data to an off-premises location. Disclaimer: The following solutions are products I haven’t had any hands on experience so far except of some offline demos. I tried to summarize the idea behind those solution in a simplified but valid manor. Being announced during last years VMworld to run customers workload on baremetal vSphere hosts within Amazon’s cloud might have been a surprise. It took exactly 1 year until VMware launched #VMWonAWS within the US (West Region). The operational model within companies will not change since the operators will leverage existing tools like the vSphere Client / PowerCLI to manage the ESXi over a vCenter server. Before the end of next year 2018 it is planned to have VMware on AWS available within all Zones. Amazon on AWS just works ………… as we are used to work with VMware. The only thing that you don’t need to care anymore is the hardware and all the related operational and procurement tasks. Additionally you can scale out the environment easily (elastic DRS). It will become big threat to some of the partners within the vCloud Air network. Hopefully VMware won’t forget them and makes fast progress on vCloud Director. In the end simplicity will win and it seems that VMware and Amazon did a great job in making AWS simple for existing admins. The technical details seems to be pretty pretty exiting – As soon as more links of the experts show up it will be added to the related links section. Appdefense has been known for some of you as project goldilocks. The idea behind AppDefense is to offer a solution to keep the data & application secure. . Analyzing regular behaviour of applications via an in-guest agent and automatically detect potential threats is the main idea behind AppDefense. Further details will hopefully follow as soon as I gather more details. Cyber Security is getting more and more relevant nowadays. The more things are getting digital, the more potential attack surface we have. The traditional approach of security is based on zero trust and react to things where there is a risk that something can happen. Getting away from a reactive approach (patching) to a pro-active approach will be the key. I am really looking forward how AppDefense will change the (huge) security ecosystem we have nowadays. People who deal today with VMware NSX know how to use it for flexibility and security within a vSphere based datacenter. Less people know that NSX exists exclusively for vSphere. With NSX-T (2.0) VMware is bringing NSX to other hypervisor(s) (KVM) and into the cloud. Like Pat Gelsinger said literally during his keynote: What ESXi has been for VMware in the last decade will be NSX for the next decade. VMware is positioning the network and security solution in the middle of everything…IoT, Cloud, Security… NSXeverywhere. NSX is a great technology (if you aren’t get certified) and is key in the future to show off that it is much more than vxlan and the distributed firewall. Eventhough I am a VCIX-NV my experience with NSX-T has been zero. Within my German customers we are still struggling to position NSX within the vSphere based datacenter of the enterprise. It wil take a while until the cloud-engine is getting started within the EMEA region. Once this is the case, NSX-T 2.0 will get interesting. With VMware ‘s announced cloud services a central platform has been announced offering to integrate existing and new cloud services.